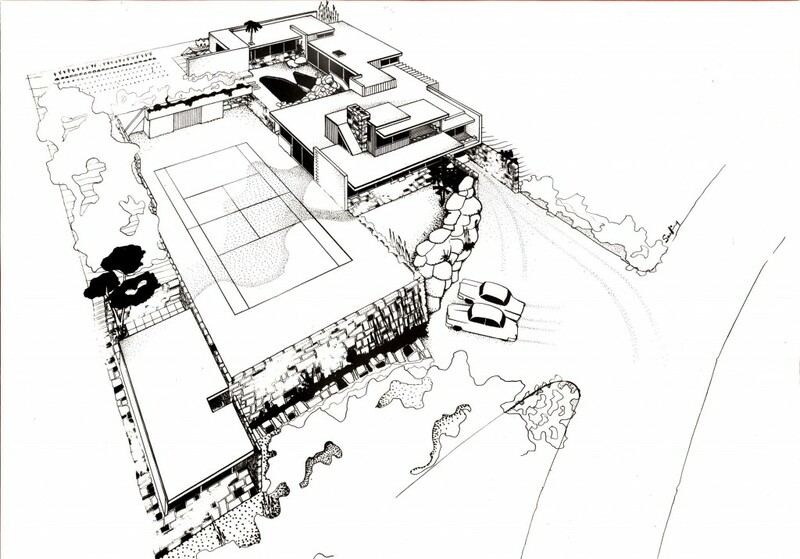 Douglas Snelling's perspective drawing of the extensively terraced Kelly House 1. Sydney's largest private residence of the 1950s – the Bellevue Hill mansion designed by Douglas Snelling for Woolworths chairman Sir Theo Kelly, his wife Nancy, and their family – has been demolished. Completed in 1955, it won a 1956 'House of the Year' Award from Architecture and Arts magazine — edited by Melbourne architect Kenneth McConnell – and its interiors were extensively featured in the June 1956 issue of The Australian Womens Weekly. Along with three other significant Snelling buildings in Sydney's eastern suburbs, it was the subject of a heritage report commissioned by Woollahra Council in the late 2000s. Measuring over 80 squares (743 sq m including outdoor courtyards and living areas), the five-bedroom sandstone residence overlooked Sydney Harbour and wrapped around a tennis court and swimming pool. In style, it was a homage to Frank Lloyd Wright's world's-first modernist buildings – the Prairie Houses of 1906-1909 (which influenced many young European architects after publication in the Wasmuth Portfolio of 1911). In floor planning, it was strongly influenced by former Wright apprentice Richard Neutra's classic mid-1940s Kaufmann house in Palm Springs, which Snelling is believed to have visited in early 1948. The property is expected to be redeveloped by the owners, who live in a Victorian mansion next door.